Messi has a better free-kick succession rate than Ronaldo, Carlos, and Ronaldinho. According to a new stat, Lionel Messi has a higher free-kick conversion rate in La Liga than most of the spot-kick veterans, including his counterpart, Cristiano Ronaldo, who joined Juventus last summer after having spent nine seasons with the Argentine's eternal rivals, Real Madrid. 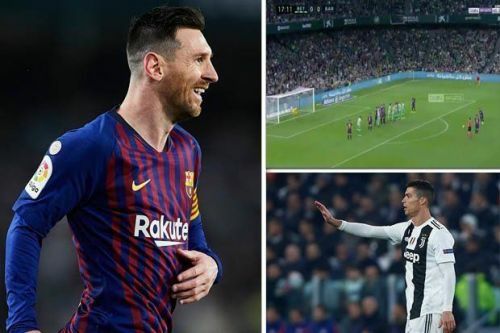 In a 4-1 victory over Real Betis in the La Liga, Messi scored a stunning hat-trick which compelled the Betis fans to give him a standing ovation. The Argentine scored a stunning inch-perfect free-kick in the top-left corner from 20 yards to open the scoring for the Catalans in the 17th minute. It was the fifth direct free-kick goal from the 31-year-old across all competitions, this term. Also, it was the five-time Ballon d'Or winner's 45th free-kick goal. No player has scored as many free-kicks since the start of the 2011/12 campaign. Apart from his dominance from the set-piece, the Barcelona talisman is leading the scoring charts in the Champions League and La Liga with 39 goals and 21 assists registered to his name, this season. According to a new stat, the Argentine sharpshooter has a better free-kick conversion rate than most of the spot-kick veterans, including Ronaldinho, Roberto Carlos, and former La Liga rival, Cristiano Ronaldo. In the 330 attempts, he has made so far from a free-kick in the league, the four-time Champions League winner has successfully found the back of the net 28 times, clocking a success rate of 8.5 percent. On the other hand, Portuguese talisman Cristiano Ronaldo, scored 19 goals of his 310 free-kick attempts during his tenure at the Spanish capital, with a success rate of 6.1 percent. Legendary Brazilian footballers Roberto Carlos and Ronaldinho had a success rate of 4.2 percent and 7.3 percent, respectively. In a bid to win a treble yet again, Lionel Messi and co. will take on Espanyol, Villareal, and Atletico Madrid in La Liga before hosting Manchester United in the Champions League. Lionel Messi vs Cristiano Ronaldo in major finals: Who has performed better?